Captain Ab. C. Grimes, a noted Confederate mail carrier, pioneer river pilot and manager of hunting preserves, died at his home, No. 437 Olive Street, St. Louis, last Monday night. He was 76 years old and had been ill for a month. His career was linked with the life of Mark Twain, the late humorist, as both were pilots and members of the same Confederate company. For thirty years Captain Grimes guided river steamers through tortuous currents. On leaving the river the old soldier located in Lincoln county and managed game preserves, which were visited by thousands of St. Louisians. Capt. Grimes moved to St. Louis four years ago. He was twice married. His second wife was much younger than he. 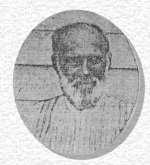 Shortly after his second marriage, in 1905, Captain Grimes shot a man whom he accused of insulting his bride. The river pilot was born to the rank as his father was a pilot on the earliest boats on the Mississippi river. His mother's brother was also a pilot and owner of steamers plying the Mississippi. When the Civil War began Captain Grimes left the river and joined a company organized at New London, Ralls County, by Captain Theodore Brace. Mark Twain enlisted in the same company on the day that Grimes was accepted. During the war General Sterling B. 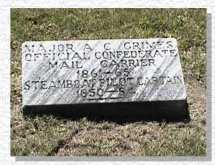 Price selected Captain Grimes and Robert Louden to act as mail carriers. These intrepid fighters smuggled mail between the soldiers in the Southern Army and the home folks in the North. Six times the late Captain was captured by Union soldiers, but on five occasions he escaped. When taken the sixth time he was incarcerated in the Gratiot Street Prison, from where he attempted to escape and got shot. Prior to his effort to escape he was sentenced to be hanged, but this was commuted through the influence of the late Archbishop Ryan of Philadelphia, who was then located in St. Louis. The Confederate soldier was sent to Jefferson City for confinement. When stealing through the lines to get his mail in the hands of the soldiers on the battlefields, Captain Grimes was assisted by many women now living here who were Southern sympathizers. After the war and his retirement from the river, Captain Grimes became manager of the King's Lake Shooting Club in Lincoln county. He remained with the club thirteen years and then built a clubhouse a few miles down the shore of the lake. This clubhouse he named Grimes' King Lake Club, where he lived for ten years. Since coming to St. Louis he has conducted a moving-picture show, next a shooting gallery and lately has worked for the General Compressed-Air Vacuum Cleaning Company. His first wife he married in New London in 1865. 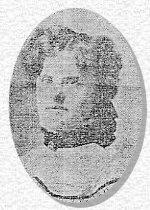 She was Miss Lucy Glascock, who died in 1903. They had seven children, of whom two survive. They are Hudson Grimes, No. 3448 Pine Street, and Mrs. W.L. Mitchell, of Ferguson, St. Louis county. Mr. Grimes' second marriage took place December 15, 1905, in Lincoln county to Miss Nell Tauke. She survives him. The remains will be laid to rest in Barkley Cemetery this (Thursday) afternoon.